P1272. WILHELM KEMPFF, w.Munch Cond. RTF S.O. : Piano Concerto #4 in G (Beethoven), Live Performance, 20 Sept., 1964, Montreux; w.Martinon Cond. 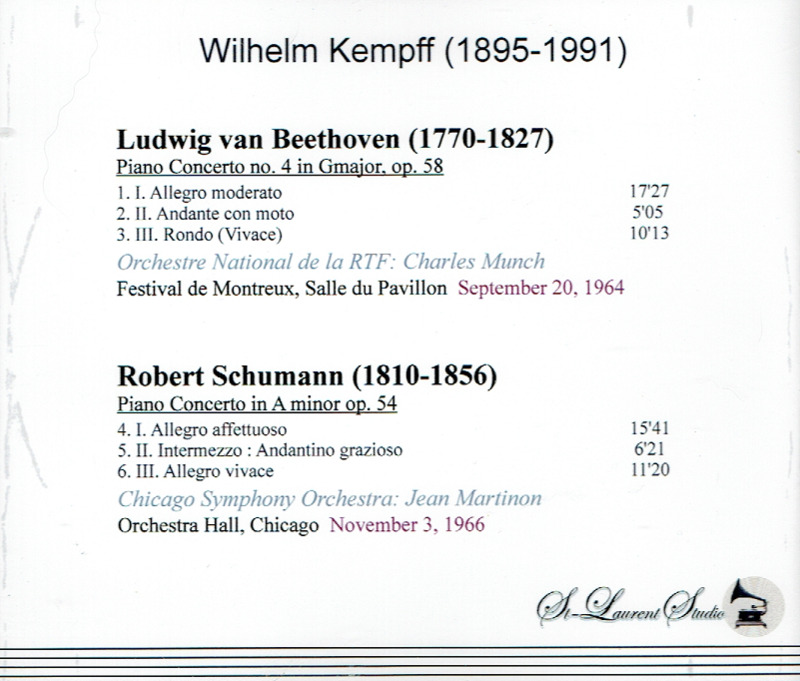 Chicago Orchestra: Piano Concerto in a (Schumann), Live Performance, 3 Nov., 1966, Orchestra Hall. (Canada) St Laurent Studio YSL T-625. Transfers by Yves St Laurent. “In the words of one of his biographers, conductor Jean Martinon's performances ‘were distinguished by a concern for translucent orchestral textures, and sustained by a subtle sense of rhythm and phrasing’. Occasionally, ‘he stressed a poetic inflection at the expense of literal accuracy’. Martinon's first instrument was the violin; he studied at the Lyons Conservatory (1924-1925), then transferred to the Paris Conservatory, where he won first prize in violin upon his graduation in 1928. He subsequently studied composition, with Albert Roussel, and conducting, with Charles Munch and Roger Desormiere. Until the outbreak of World War II, Martinon was primarily a composer. His early substantial works include a Symphoniette for piano, percussion, and strings (1935); Symphony #1 (1936); Concerto giocoso for violin and orchestra (1937); and a wind quintet (1938). At the start of the war he was drafted into the French army. Taken prisoner in 1940, he passed the next two years in a Nazi labor camp. There, he wrote’ Stalag IX’ (Musique d'exil), an orchestral piece incorporating elements of jazz; during his internment, he also composed several religious works, including ’Absolve’, ‘Domine’ for male chorus and orchestra, and ‘Psalm 136’ (Chant des captifs), the latter receiving a composition prize from the city of Paris in 1946. Upon his release from the Nazi camp, Martinon became conductor of the Bordeaux Symphony Orchestra (from 1943 to 1945) and assistant conductor of the Paris Conservatory Orchestra (from 1944 to 1946), then associate conductor of the London Philharmonic (from 1947 to 1949). He toured as a guest conductor as well, although his U.S. debut did not come until 1957, with the Boston Symphony giving the American premiere of his Symphony #2. Although he devoted as much time as he could to composing in the early postwar years -- producing a string quartet (1946), an ‘Irish’ Symphony (1948), the ballet ‘Ambohimang’a (1946), and the opera HÉCUBE (1949-1954) -- he was increasingly occupied with conducting, working with the Concerts Lamoureux (from 1951 to 1957), the Israel Philharmonic (from 1957 to 1959), and Dusseldorf Symphony Orchestra (from 1960 to 1966). Martinon resumed his career as a composer around 1960, writing his Violin Concerto #2 (1960) for Henryk Szeryng, his Cello Concerto (1964) for Pierre Fournier, and his Symphony #4 (‘Altitudes’), composed in 1965, for the 75th anniversary of the Chicago Symphony. He acknowledged Prokofiev and Bartók as strong influences on his scores, which meld Expressionism with French Neoclassicism. Martinon continued composing into the 1970s, but he seldom recorded any of his own music, with the notable exceptions of the Second Symphony, ‘Hymne la vie’ (ORTF, for Barclay Inedits) and Fourth Symphony, ‘Altitudes"’ (Chicago SO, for RCA). 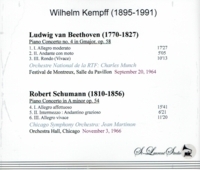 In 1963, he succeeded Fritz Reiner as head of the Chicago Symphony. Martinon's tenure there was difficult. 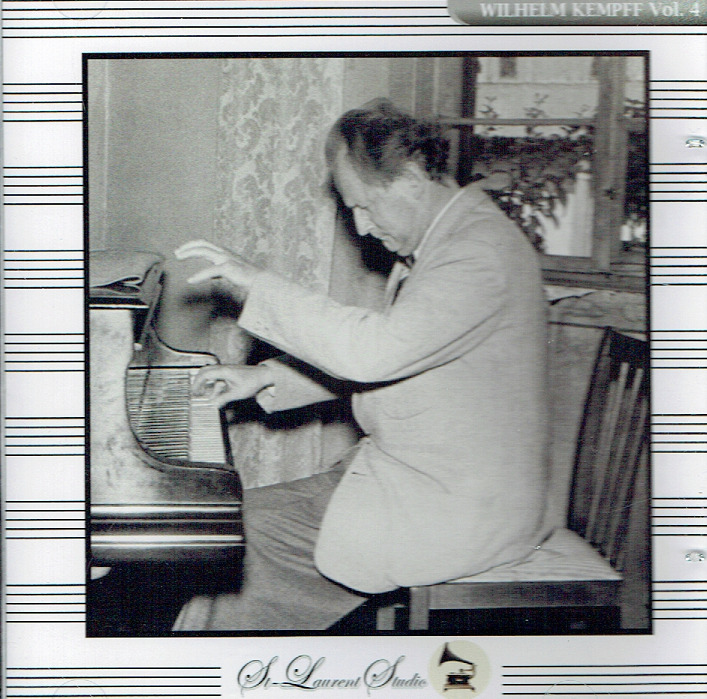 In five seasons, he conducted 60 works by modern European and American composers, and made a number of outstanding LPs for RCA, mostly of bracing twentieth century repertory in audiophile sound. Chicago's conservative music lovers soon sent him packing.